The Picton Garden & Old Court Nurseries01684 540416work GardenThe Picton Garden & Old Court Nurseries – home of the Plant Heritage National Collection of Autumn Flowering Asters. The Picton Garden & Old Court Nurseries has a proud history and heritage and boasts the wonderful National Collection of Asters – known as Michaelmas Daisies here in the UK – that has been cultivated and developed at Old Court Nurseries since 1906. Late summer and autumn are magical as the vibrant colours of the 400+ varieties come into full bloom. Grown in profusion with other late season perennials and shrubs, the Michaelmas Daisies put on a great show! 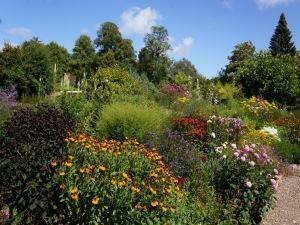 The Picton Garden is open from August until mid October including many days for the National Gardens Scheme. Check the latest NGS Yellow Book and website for dates, or give a call for opening dates and times. The garden has been featured in many magazines and newspapers and has been on several television programmes – come and see it for yourself! During your visit you will be able to purchase plants from the nursery in Colwall and plants are available by mail order each spring. Take a look at the online catalogue for more details, or request a printed copy of the brochure or a list of items via email by contacting Old Court Nurseries. On the B4218 between Ledbury and Malvern off the A449. Just 5 miles from Malvern and 6 miles from Ledbury, Colwall Rail Station is just a 10 minute walk away.